STICK UP FOR YOURSELF! WINNER! The National Parenting Center SEAL OF APPROVAL EVERY KID'S GUIDE TO PERSONAL POWER AND POSITIVE SELF-ESTEEM. Have you ever been picked on at school, bossed around, blamed for things you didn't do, or treated unfairly? Do you sometimes feel frustrated, angry, powerless, and scared? Do wish you could stick up for yourself, but you don't know how? This book can help. 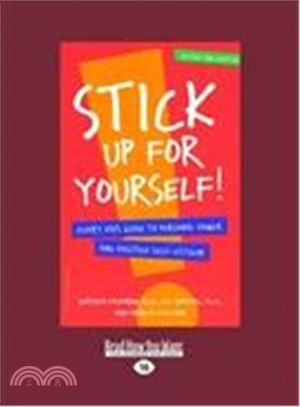 In simple words and real-life examples, it shows you how to stick up for yourself with other kids (including bullies and teasers), big sisters and brothers, even parents and teachers. It tells you things you can say without putting people down, and things you can do without getting into trouble. You'll feel better about yourself, stronger inside, and more in charge of your life. You'll also learn about yourself and what's important to you. You'll find out about your feelings, needs, and dreams for the future. You'll see that you're responsible for your own behavior and your own feelings - nobody else's. You'll learn positive ways to deal with strong feelings like anger, fear, jealousy, and shame. And you'll discover simple ways to ''store'' happiness and pride for times when you need them the most. First published in 1990, this book has helped countless kids build self-esteem and be more assertive. It can give you the power to stick up for yourself, be true to yourself, and feel secure and confident inside - no matter what. Gershen Kaufman, Ph.D., is Professor Emeritus at Michigan State University and the author of several books. Lev Raphael, Ph.D., is a prize-winning author of dozens of novels and short stories. Pamela Espeland has authored and coauthored many books for children and adults.